One of the best things about being a grandparent is witnessing the close and affectionate relationships that develop between many cousins. The flip side of cousin love, however, is cousin rivalry. Competition between cousins can be every bit as intense and bitter as sibling rivalry. And chances are, grandparents, that it will occur on your watch. All the triggers commonly seen in sibling rivalry can also operate to spark a royal case of cousin rivalry. Jealousy is, of course, the major triggering factor. Cousins are more likely to be jealous of each other if they are close together in age and the same gender. Sometimes the cousins are competing for a grandparent's attention. Sometimes they are competing for attention from another cousin. Family dynamics also play a role. Sibling rivalry and cousin rivalry are sometimes seen as bids for attention from children who, for whatever reason, don't get as much consideration as they need. Sometimes, however, the situation is quite the contrary. A only child or the baby of a family may not be used to competition at home, but being thrown in with a whole group of cousins at a grandparents' house is quite a different story. Grandparents who are hosting Grandma camp are practically guaranteed to have to deal with some outbreaks of cousin rivalry. Children can exhibit cousin rivalry at all ages and stages. 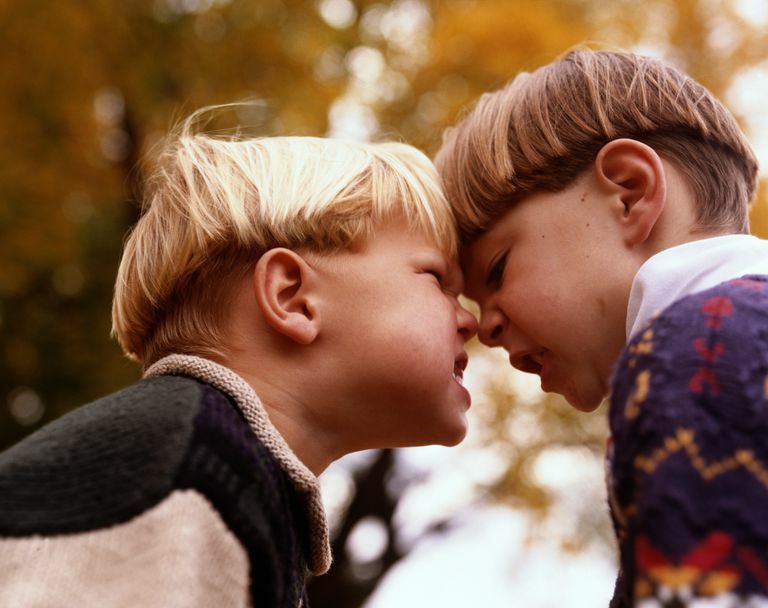 Sibling rivalry reaches its most intense level between in school-age children between the ages of 8 and 12, and the same is typically true of cousin rivalry. During this 8-12 window, children are likely to engage in physical contact, and they are strong enough to hurt each other. That means that the rivalry may turn physical, and grandparents may have to intervene sometimes. It's also important to distinguish between cousin rivalry and bullying. Genuine cousin rivalry involves a lot of back-and-forth. One cousin may be the one who always ends up crying, but that can be because he or she is more prone to tears. When the aggression is mostly one-sided, it may spring from feelings of jealousy, but it is better characterized as bullying and treated with more seriousness. Often clashes between cousins become a vicious circle that neither child is able to back away from, because that would mean that being the "loser." Thus avoiding situations that trigger rivalry may be the best solution. Equalize competition whenever possible. There's nothing wrong with giving a younger child an extra swing at the ball, for example. And if the younger child then defeats an older child, the older child will at least know that the younger child was given an advantage. Emphasize the fun of the activity more than who wins. This is a great idea that usually works with younger kids. As children get older, however, they typically insist on keeping score and knowing who the winners are. Avoid activities in which one child has a huge advantage. Introduce elements of luck whenever feasible, even into sports. Avoid praising the winner and razzing the loser. There will be plenty of time for such good-natured teasing when the grandkids are more mature. Some grandparents simply let the grandkids play and let the chips fall where they may, saying that kids have to learn to be good losers. That is true, but grandparents suffer, too, when every activity ends in a meltdown. When avoidance techniques don't work, grandparents need to have a plan for dealing with cousin conflicts. It's best if they have developed their strategies in conjunction with the parents, but sometimes that's not feasible. A plan begins with letting the grandchildren know what behaviors will not be tolerated. Usually hitting and name-calling are on the no-go list. If cousins become embroiled in a quarrel but aren't hitting or calling names, you may want to let them have a go at settling it themselves. If you see signs that the conflict is escalating rather than winding down, it may be time to step in. Listen to both sides, but don't try to decide who started it and don't assign blame. Just try to get them past their disagreement. If there is no resolution in sight, you may want to distract them with a different activity. For more intractable cases, separating the cousins can be an effective strategy. They really do want to play with each other, in spite of their quarrels, and sometimes will quickly get over their irritation if they are facing the prospect of having to play alone. The other strategy that works even better is humor. If you can somehow get the cousins laughing, they will be back in a good mood with each other in a jiffy. Bribery is also a possibility. While some grandparents may scoff at the idea of rewarding grandchildren for simply behaving, others are fine with offering a little positive reinforcement for keeping disagreements to a minimum. Of course, grandparents who offer rewards for good behavior must stick to the bargain. No reward should be dispensed if the behavior has been sub par. Working with the combination of grandchildren that you have over at one time can also yield results. If you have observed that rivalry gets really intense between A and B when C is around, avoid that cousin combination, or bring in cousin D. You may even have to resort to entertaining A and B separately. Remember that you won't have to do this forever. Most cases of sibling and cousin rivalry are outgrown. It goes without saying that kids will get along better if they are well-rested and well-fed. It also goes without saying that they don't always eat and sleep well at their grandparents' houses because they are out of their usual environment. Outbreaks of sibling rivalry can also be triggered by other stress in a child's life. Grandparents can play important roles in helping grandchildren handle stress. Providing a calming environment with comforting rituals can help. Active play is also an effective stress reliever and can be a way to break the cycle of jealous behavior. It's important to remember that this, too, will pass. It's likely that when the cousins are grown, they won't even remember their disagreements but will instead remember all the fun they shared.